ASV Holdings Inc. offers the large-frame, radial-lift RS-75 and vertical-lift VS-75 skid-steer loaders. The machines feature highly efficient hydraulics and cooling systems, as well as best-in-class high ground clearance, departure angle and serviceability. The skid steers are ideal for a wide range of applications, including rental, construction, landscape, snow removal and forestry, according to the manufacturer. 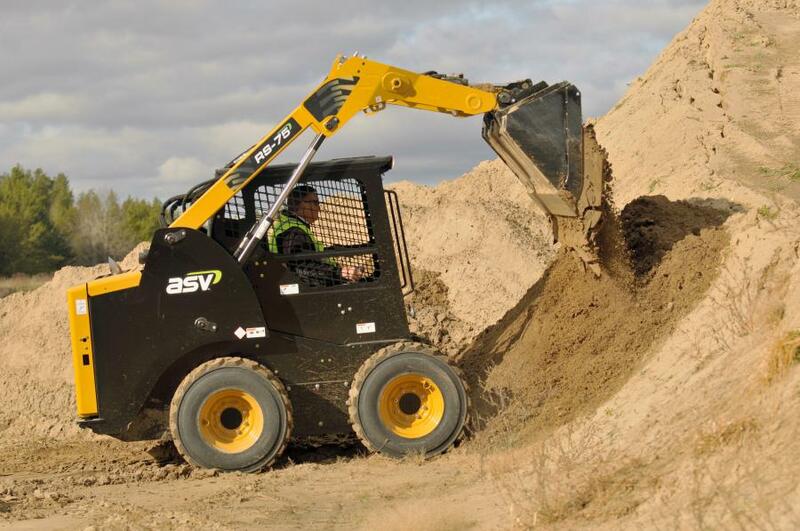 ASV builds the RS-75 and VS-75 with dedicated skid-steer frames. Unlike other manufacturers that use a single chassis for both compact track loaders and skid steers, ASV designs the frame for its Posi-Track and skid-steer lines independently to provide customers with the highest performance. The result for the RS-75 and VS-75 is a 10.5-in. (26.6 cm) ground clearance, more than 2 in. (5 cm) higher than any machine in their class. This allows the machines to easily travel over obstructions such as logs, stumps and rocks with less risk of getting hung up. The purpose-built chassis also allows for a 24-degree departure angle, decreasing the risk of the machines getting stuck when starting to climb a steep hill, according to the manufacturer. The RS-75 and VS-75 have a swing-out door and the cooling system opens quickly to expose the engine, filters and other daily checkpoints for easy maintenance. ASV includes drain plugs on all service items, including chain cases, the hydraulic tank, the radiator and the engine oil pan, to speed the draining process. Zerk fittings on the end of all pins make greasing easy. Standard metal-face seals ensure the drive hubs don't require maintenance for the life of the machine. In addition, the machines feature a direct-drive pump, eliminating the labor-intensive belt servicing that comes with belt-driven pumps. All of these features mean less downtime spent servicing the machine and more time operating it. The high speed of the RS-75 and VS-75 — as fast as 11 mph when equipped with optional two-speed drive — allow for fast and easy travel uphill or downhill as well as over rough, uneven and wet terrain. To achieve these speeds, ASV designed the machines with efficient hydraulics, optimal cooling capacity and high-quality drive system components. Both models feature an industrial 74-hp diesel engine. Built for power and reliability, the naturally aspirated 2.9-liter displacement engine produces 192 foot-pounds of torque. The Tier IV Final engine requires no regeneration, exhaust sensors or diesel exhaust fluid. ASV designed the skid steers' auxiliary hydraulic systems to operate efficiently with optional 30.9-gpm high-flow pump capacity and 3,335 psi system pressure. The machines include large line sizes, hydraulic coolers and direct-drive pumps, transferring more flow and pressure directly to the attachment and preventing power loss. This design optimizes performance so operators can run attachments more efficiently than with higher-horsepower competitive units. Many other machines, with belt-driven pumps and restricted hydraulic systems, lose as much as 30 percent of their horsepower when operating attachments, according to ASV. 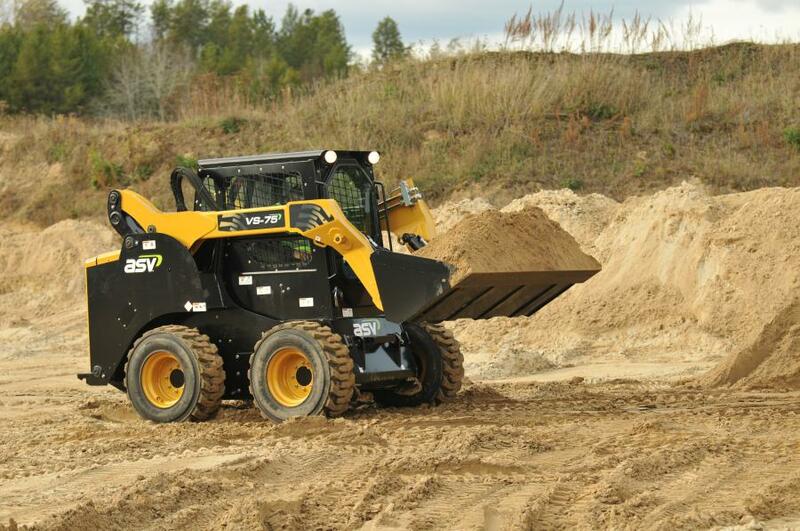 In addition, the ASV models' skid-steer-focused design provides optimal weight distribution, reducing tire wear while maximizing lifting capacity. The VS-75 features a rated operating capacity of 3,500 lbs. (1,587 kg) and a tipping load of 7,000 lbs. (3,175 kg) while the RS-75 has a ROC of 2,600 lbs. (1,179 kg) and a tipping load of 5,200 lbs. (2,358 kg). Both machines are 72 in. (183 cm) wide, and the RS-75 has a 10.4-ft. (3.1 m) lift height while the VS-75 has a 10.8-ft. (3.3 m) lift height. Standard reversible wheels narrow the machines to 66 in. (167.6 cm) for improved mobility in tight spaces. In addition, ASV manufactures the machines to be over-the-tire track ready. Standard hydraulic joystick controls make operation easy and intuitive. The RS-75 and VS-75 feature industry-standard quick-attach to accommodate all conventional attachments. An optional all-weather cab not only includes heat and air-conditioning but also is pressurized for a clean operator environment. ASV RS-75 and VS-75 skid-steer loaders include 1-year warranty coverage for the full machines and a 3-year/3,000-hour powertrain and hydraulic system warranty. For more information, visit www.asvi.com.